I've had a little bit of crafty time this week, but no pics yet... stay tuned for that. In the meantime, do you Pinterest? Aaak! So addictive. By that definition, it's time to exercise my spirit of self control... no more this week. Seriously though, I get asked a lot about where I get ideas for parties, projects, sewing etc. Well, it all began when we first got our iMac in 2006. I'm not even sure of how I came across it, but I found my first sewing tutorial. Up until that point, I had never heard of a blog let alone the vast community of artists online. Well, thanks to Melissa (Tiny Happy), I have never looked back. In the comments from the post on her shoulder bag tutorial, I found links to other blogs and was happily introduced to blogdom. I have benefited from sooooo many free tutorials from lovely domestic bloggers. I have tried my hand at things that I never would have tried without the guidance of someone and I'm so glad that I did. I constantly have ideas in my bookmarks and now on Pinterest that I'm itching to try or wishing for an occasion to try it. 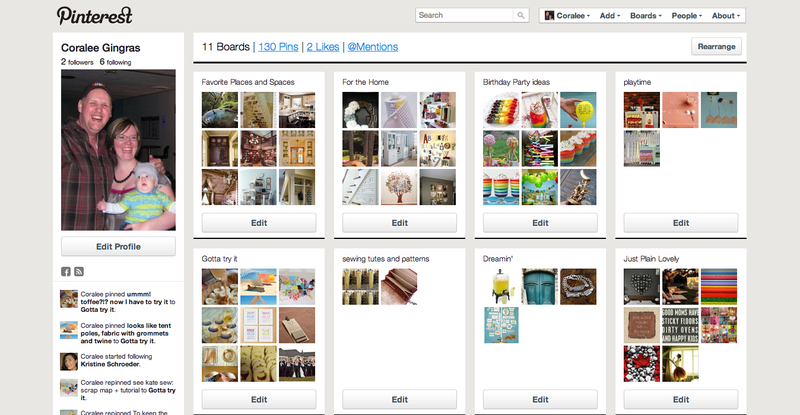 I've researched theme ideas for parties, dreamed of do-it-yourself projects just from seeing someone else's creativity. I think though, that I probably spend too much time "being inspired" and not enough time "doing inspired" things. So, I think that, unless researching for a specific event, I will probably limit my inspiration searches to once a week. This should help to insure that I spend more time working on my own projects and less time drooling over other people's. If you do check out Pinterest... don't I say I didn't warn you. This is me warning you... highly addictive!!! There have been some questionable pins that I've come across also ones I disagree with, but that's the internet for you. I choose not to throw out the baby with the bath water. Also, you can browse without an account, but you need to be invited to join and post on your own boards. If you want to join, leave me a comment and I'll send you an invite. Oh, and for real life things I love. You know, ones I've actually touched, bought and used... Pumpkin soap from Rocky Mountain Soap Company. Aaaak! Best soap ever! It's specifically designed for Eczema, which I don't have, but it's deep moisturizing qualities make it great for anyone. When I was pregnant with Abigail, I had such terribly itchy skin. I could barely stand it. Well, I remembered the recommendation for Pumpkin soap from someone and bought a bar. I haven't looked back. Our whole family uses it and I won't use anything else. Love it.